Time is the new currency in this digital age of instant gratification where even the personalization of our homes can be simplified. 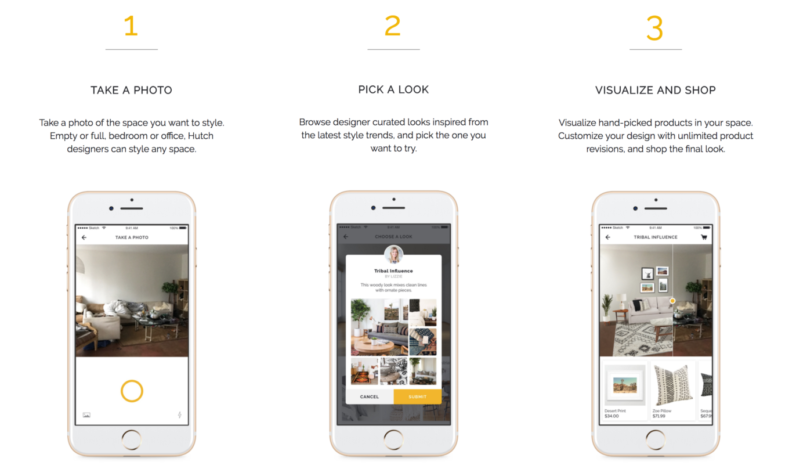 Step forward Hutch, an app that uses Snapchat’s face filter ethos to design the interior of your home and even furnish it too. If it sounds like a familiar concept, that’s because Hutch is the second iteration of the chat-based design app Homee, which many will remember from ABC’s “Shark Tank” in 2015. Although it was originally deemed an attractive feature to talk directly with a designer through the app, it quickly became apparent that people just wanted to decorate their homes with a few swipes on their smartphone with minimal fuss. The launch of the new Hutch app focuses entirely on visualization. More importantly, it also represents a learning curve around the importance of listening to want users what and not being afraid to pivot to make it happen. After opening up the Hutch app for the first time on your iOS or Android phone, users are invited to take a photo of the room they want to virtually transform to one of many themes from Boho to Urban Industrial. In a nutshell, it’s the equivalent of seeing all those items from your Pinterest boards in your home before you buy them. Once you are happy with your virtual design and have added any additional furniture, it’s just a case of sitting back and waiting for it all to be delivered to your humble abode. The ease of confirming your chosen design is aesthetically pleasing with a ‘before and after’ effect is remarkably reminiscent of swiping for a date on Tinder and there is a good reason for that. Anything that eliminates the hassles of taking room measurements, heavy lifting and transportation of furniture from the store to your home, and the time required to redesign a room or talk to a designer will be welcomed by many. The technological advances have enabled us to progress from adding flower crowns to our photos to producing designer-curated styles for our homes. But, could Hutch be the first in a long line of apps that pave the way for a new generation of visualized commerce? In a world where we are frequently faced with an overwhelming choice and too many options, it seems that most of us are secretly yearning for a simple life. Uber and Airbnb have made getting a ride and somewhere to stay within a few swipes of our phone, these are the expectation levels in this digital age. The most inspirational part of this story is how the team were unafraid to pivot and launch Hutch after user feedback from its previous iteration Homee. Fascinated by this entrepreneurial story, I recently spoke to Beatrice Fischel-Bock, the CEO and founder of Hutch on my podcast who talked about her rollercoaster ride of a startup journey.